Over the years in my own articles, I have used the terms “creeping fascism,” “growing police state,” and “descent into totalitarianism” among others to describe the domestic situation in which we find ourselves. I have often written that, if Americans do not stand up to the myriad of laws being passed by federal, state, and local governments we will soon wake up to find ourselves in an Orwellian police state nightmare. Now, however, I cringe whenever I read those words in contemporary articles. This is because such warnings are so far past their time they are utterly useless. In fact, they may do more to hurt any potential for change in American society than they do to promote it. But the police state is not coming – it is here. Americans may not be able to admit it to themselves but the military soldiers parading on the streets as police officers, police-operated tanks, and horrifying number of imprisoned citizens have spoken for them. The number of Americans brutalized physically and mentally by those who are sworn to “serve and protect” are speaking clearly enough. The relatively recent concept of “pain compliance,” “rough interrogation,” and “rough rides” coupled with the long held tradition but fast increasing commonality of direct beatings, shootings, murders, and “on-site executions” by police in America have had the final say. Since 2003, police have killed more American citizens than were killed by “insurgents” in Iraq, a country whom the US invaded illegally and subsequently imposed a reign of terror upon. The United States is now a country where millions of people are locked away in inhuman conditions of confinement, the overwhelming majority of them for crimes in which there was no victim. From the federal, state, and local levels, behavior previously considered normal and innocuous is now mandated and regulated by a tangled web of government agencies. Of course, any disagreement or defiance of those mandates will result in a clash from the militarized police forces mentioned above and an eventual confinement to a cage where the offender is treated like an animal at best. In the United States of 2016, children are regularly removed from parents by the State simply because of the parents’ economic status, political beliefs, or methods of upbringing. Surely no country that imprisons as many people as America, “enforces” oppressive law with military-style troops, and snatches children away from loving homes simply because those homes are not the ideal model of what the state desires can be called a free country. With the recent increase of PC fascism enveloping the nation, even free speech and expression, no matter how ineffectual, is becoming regularly silenced by the long arm of the law. Children are being routinely arrested for acting out in elementary school while citizens learn that their first “duty” in America is to “obey” police authority lest they be subject to brutal takedowns, torture, and possibly death. This is the America many warned about years ago when they protested the militarization of police but were met with responses citing “officer safety” and “growing crime rates.” It is the America they warned about when they opposed the drug war but were met with programmed responses of a “drug-addicted youth” and “drug-related crimes.” It is the America many could see coming a mile away when the State-sponsored threat of terrorism was used to justify any and all means of “keeping us safe” and providing “security” to the frightened citizens of the world empire. Those warnings were ignored and now we have the result. 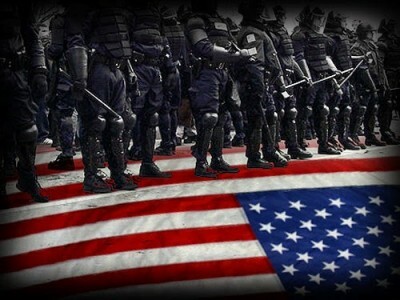 It is now time to call the United States what it is – a police state. Brandon Turbeville – article archive here – is the author of seven books, Codex Alimentarius — The End of Health Freedom, 7 Real Conspiracies, Five Sense Solutions and Dispatches From a Dissident, volume 1and volume 2, The Road to Damascus: The Anglo-American Assault on Syria, and The Difference it Makes: 36 Reasons Why Hillary Clinton Should Never Be President. Turbeville has published over 650 articles dealing on a wide variety of subjects including health, economics, government corruption, and civil liberties. Brandon Turbeville’s radio show Truth on The Tracks can be found every Monday night 9 pm EST at UCYTV. His website is BrandonTurbeville.com He is available for radio and TV interviews. Please contact activistpost (at) gmail.com.